There's another wave of awesome pizza hitting Philadelphia. Thank goodness because we would not be the first comment that this city isn't exactly flourishing with good take out pizza. 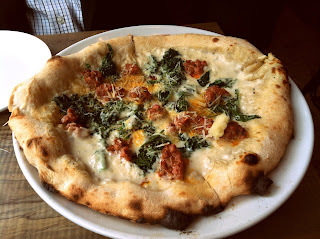 Sure, there are plenty of restaurants to get fancy pizza - Stella, Zavino, Osteria - and they are all great. In the next few weeks, we'll cover a few of the less-nonsense spots we've tried lately and will definitely be going back. 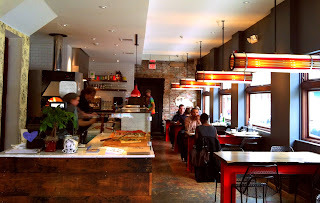 Interior - handful of tables for 2-6 people, plus bar stools. Bufad was opened February 1 by the folks behind Prohibition Taproom. It's a straight up yet kinda funky 30-seat pizza shop at the corner of 13th and Spring Garden that was packed on a Thursday for lunch when I went (the photo is from after most of the crowd left). The menu includes fancy-sounding starters that I didn't try, 3 salads, 6 personal size pizzas and a chalkboard of specials, including a soup and panini of the day and several inventive square slices, such as beet with ricotta and salsa verde. The tomato fennel soup came out piping hot with crumbled herbs and melting croutons, plus housemade bread for dipping. 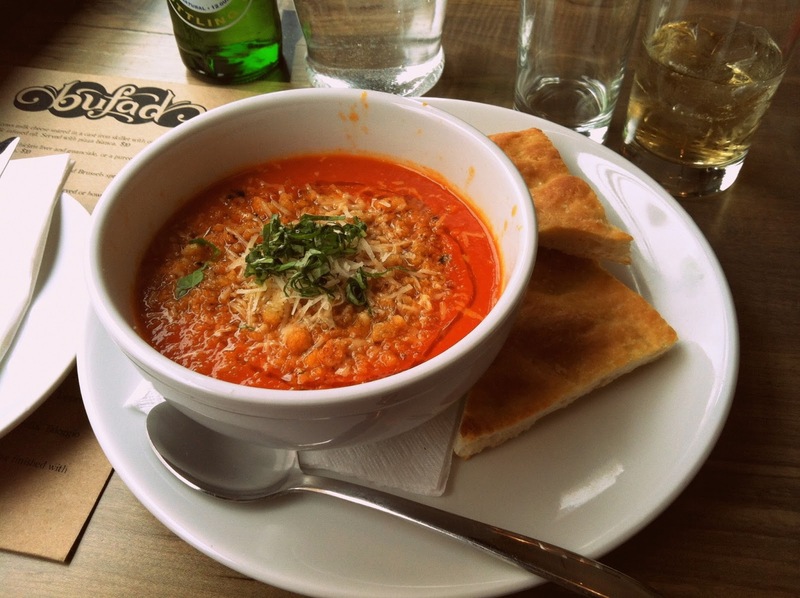 It's made entirely with crushed tomatoes - no cream base - so it was a perfect all natural, hearty bowl to warm me up on a chilly day. The pizzas were equally satisfying. 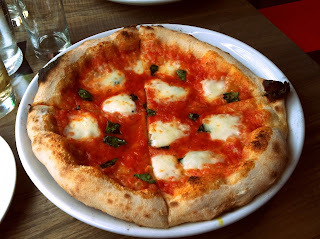 The Margherita has San Marzano tomato sauce, fresh mozzarella, torn basil and olive oil. Very fresh and not greasy; no complaints here. The crust, which appears the same for all pizzas, is light and tasty on its own. The pizzas are wood-fired so expect a few burnt edges. My lunch companion and I liked the house made fennel sausage pizza even better, with sautéed greens and cacio e pepe (simple parmesean, pecorino and pepper mix often found on pasta, like at Amis). A simple, delicious white pizza. The other options get a little more dramatic with toppings but we usually try to base the first look on the traditional options. I also have to comment that service was great. My friend was stuck in traffic and the Bufad waiter kept me laughing throughout the wait. Bufad is also a BYOB, so if you go at dinner, or are so inclined mid-day, bring along a bottle of wine or some brews (which you can take away from Prohibition Taproom if needed). Bufad does take out pizza but nothing I've seen so far indicates they deliver. Looks really good. What's your favorite place in Philly for pizza? Looking forward to the rest of your pizza tour! Hi Tala, it was great. You should try it. Tough to pick a single fav but the original Tacconelli's in Port Richmond is one of the best. Stay tuned for a post on Pizza Brain, also awesome. For something a little different, we love Stogie Joe's upside down pizza on East Passyunk too.